MAYBE IT EXPLAINS WHY ECONOMISTS CAN FORECAST NOTHING? I’ve alluded several times to Mason Gaffney’s engaging account of how universities such as Cornell were endowed and set up to kill off the idea advocated by many social philosophers throughout history, but especially as distilled and expressed so powerfully in Henry George’s “Progress and Poverty” in 1879. Everyday people responded positively to the process so clearly described by George. For the first time in history they were cottoning onto how much of the wealth they produce is stolen by taxation-promoting, parasitic rentiers. This small but wealthy rentier band reacted urgently to George. His idea must be killed off quickly in universities by conflating land and capital. This new paradigm must be enforced within academe and Georgism excised from economics altogether. Its proponents should be excoriated and derided, and antagonists declaim that “economic rent is only a tiny part of the economy today anyway”. Thus was the 18 year cycle of boom and bust set in concrete; thus did the earnings of the poor and middle class continue to be reduced by taxation; thus did rent-seeking parasites dine obscenely off publicly-generated economic rent; thus, as Mike Moore said in Madison Wisconsin last Saturday, do 44 US citizens accumulate unto themselves the same amount of wealth owned by 150 million of their brothers and sisters. And so it has become de rigueur for modern economics to pooh pooh Henry George’s ‘fiscal adjustment’ to set economies aright; that is, to use the publicly-generated rent of land and natural resources, instead of taxation, for revenue. Hmmm … so that’s 2 percent, well under one percent and 4.2 percent? Where lies veracity and intellectual rigour in these three opinions? The truth is that it lies far from each of these poorly researched sources. “Economists have, because of the lack of a satisfactory basis for isolating and understanding the causes of economic phenomena, occurring in a world of infinite complexity, been compelled to develop their methodology within a framework of imaginary models and to show, by reasoning, how a given set of conditions is always and inevitably followed by particular effects. A phenomenon is then explained by showing that it is bound to occur by the operation of the set of conditions postulated by the hypothesis. The illustrations are, however, often vested with an air of unreality because, in the desire to achieve simplicity, the process of elimination is carried so far that the only factors remaining are more appropriate to the Garden of Eden. …. The theory of valuation is a pragmatical extension of economic theories relating to value and price, but it is remarkable to find that there is an almost complete dissociation between economic theory and the theory of valuation, although the latter from the materialistic viewpoint stands in the forefront of the social sciences. …. The professional valuer with his insistence on demonstrative proof and acceptance of harsh realities has displayed intolerance of the tenuous abstractions of pure economics. His is a branch of applied economics, which takes into account all the complexities of land utilization and of commerce, and is closely aligned with scientific method, in that it depends upon empirical verification of hypothesis. …. So, could the Land Values Research Group find an economist who might undertake impartial research into the real quantum of land rent within the Australian economy? We did: Dr Terry Dwyer. 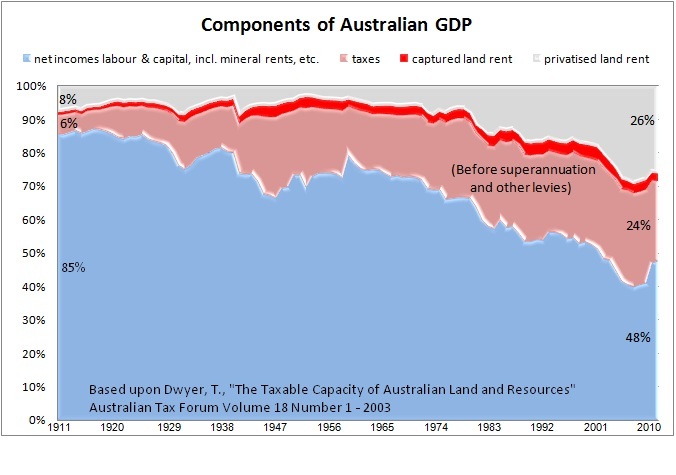 His paper “The Taxable Capacity of Australian Land and Resources” provides a time series analysis of land rent from 1911 to 1999. It was published in the refereed academic journal Australian Tax Forum Volume 18 Number 1, 2003. I have used Dwyer’s technique to extend his analysis to 2010 and constructed the chart below to put it into pictorial form. It assists to correct the nonsensical sort of economic rent estimations provided by Pen, Buchholz, Clark and others. Table 61 in Australian Bureau of Statistics Catalogue 5204.0 assesses Australia’s total land (site) values at $3.6144 trillion in 2010. Even on Clark’s (highest) estimate of rent being only 4.2% of Australia’s c.$1.35 trillion economy, viz, $56.7 bn, this is suggestive of a capitalization rate of 1.5%. As Dr Murray might have said: how totally unrealistic can economists get? ps: I’m a professionally qualified valuer. 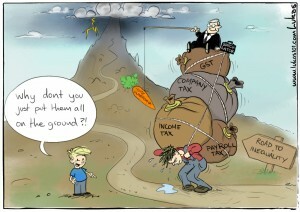 Economists need to speak to us about the extent of land rent in the economy. I’m not sure whether Pen, Buchholz or Clark were able to forecast the global financial crisis. Quite independently, Georgists in the US, UK and Australia did. Maybe the Georgist school of economics is onto something? Indeed, Andy. You can bet, as with Henry George, the minions of privilege and corruption will be out to bury the recommendations of Ken Henry’s panel as they relate to land and natural resource rents. I’d be very surprised if Martin Parkinson and many senior economists within Treasury don’t understand the urgency of capturing a far greater part of our economic rent, so we may abolish most of our 128 socially damaging taxes.